We take great pride in fabricating custom sheet metal for all of our installations. A lot of companies cut corners these days by installing premade metal or worse yet, premade duct board. Then when they get to your home they rig it in place with tons of tape and plenty of screws. It makes their job fast and cheap – but it leaves you with years of headaches not to mention high utility bills! We know there is a better way – the old fashioned way. We build it by hand to custom fit your homes exact measurements. Why Take the Time to Do This? Simply-Because it Lasts. No leaking tape to reseal after the first hot summer. No gaps to fill in with caulk or foam-o-fil. 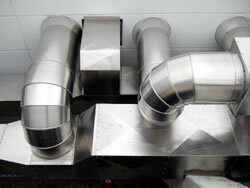 Just a clean, smooth fitting, custom piece of duct work that lasts the life of your air conditioning and heating system. Need a Custom Piece of Metal or Drain Pan?